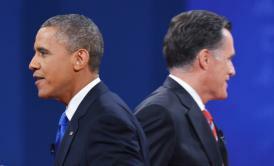 Climate change debate questions: Global warming left unmentioned for first time since 1988 VP debate. Needless to say, climate change remained one of the “things we didn’t get to” last night, marking the first time that the topic didn’t make an appearance in the round of presidential and vice presidential debates in more than two decades, and providing the latest example of how green issues have been largely left out of this year’s election. We’ve all just finished – most America has just finished one of the hottest summers it can remember. And apparently this year will be the fifth out of the last nine that are among the hottest on record. No one knows, but most scientists think, that something we’re doing, human beings are doing, are exacerbating this problem, and that this could, in a couple of generations, threaten our descendants’ comfort and health and perhaps even their existence. As Vice President what would you urge our government to do to deal with this problem? And specifically as a Texan, could you support a substantial reduction in the use of fossil fuels which might be necessary down the road? For what it’s worth, according to the website Climate Silence, which as it’s name suggests tracks these things, global warming was largely the domain of VP candidates during its first few debate appearances. The first time it came up during the main event wasn’t until the second presidential debate between Al Gore and George W. Bush in 2000.